The latest issue of Newtype magazine has revealed a brand new visual for the upcoming second cour of ufotable’s Fate/stay night: Unlimited Blade Works anime, debuting from April 4th. 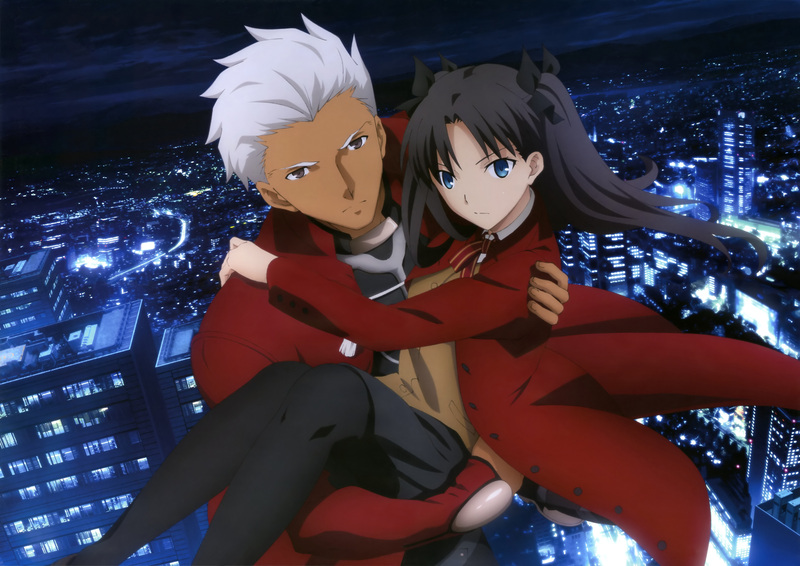 This new visual features the lovely and captivating Rin Tohsaka being carried in the arms of Archer. Kalafina will be performing the Ending theme of the upcoming second season of Fate/stay night: Unlimited Blade Works. The Ending will be titled ring your bell and the official single will be sold on the Sony Music store from May 15th for a total of ￥1,500 (~ $12.53 USD). The anime’s Opening theme was earlier revealed where Aimer will return and perform the song Brave Shine. The series will be once again directed by Takahiro Miura (Kara no Kyoukai 6: Boukyaku Rokuon) with Hideyuki Fukasawa (Vividred Operation) composing the music and ufotable (Fate/Zero, Kara no Kyoukai Movie Series) animating the series. The first Blu-ray boxset of the anime’s first cour will release on March 25 in Japan. Fate/stay night is a visual novel released by Type-Moon for the PC in 2004, and is the first in their Fate series. The visual novel was very successful and claimed the title of highest selling visual novel in that year. 2006 saw two adaptations of the game, a manga by Datto Nishiwaki and an anime series by Studio Deen. Additionally in that year, a light novel series titled Fate/Zero was written by Gen Urobuchi. It is a prequel to the visual novels, set 10 years prior. An anime and manga adaptation of Fate/Zero were created, with the manga written by Urobuchi himself in 2011 and the anime being animated by ufotable. A second season of Fate/Zero was also produced. uftoable earlier announced that they would be producing a new Fate/stay night anime based on the Unlimited Blade Works route and a Fate/stay night film based on the Heaven’s Feel Route. Raised by a mysterious sorcerer after the horrific death of his parents, Shiro Emiya has only just begun to help others using the small tidbits of magic that he’s learned. However, when he’s suddenly caught in a battle between two more powerful Magus, Shiro finds himself performing a spell above his expected ability, summoning the beautiful spirit warrior Saber to protect him! But safety is only momentary as Shiro and Saber now find themselves thrust into in a secret world of dark magic and deadly challenges: a no-holds barred duel to the death known as the Holy Grail War! At stake: a prize of unimaginable power. But can the inexperienced Shiro and Saber survive long enough to even enter the contest? First they’ll have to withstand waves of treachery and assassination, even as Shiro scrambles to learn everything he’ll need to know to stay alive as seven teams of Magus and Spirit Servants face off in mortal combat! The second cour of the Fate/stay night: Unlimited Blade Works anime will be airing from April 4th on Tokyo MX in the Spring 2015 anime season. Further information about the anime will be revealed soon.